Almost 3 times thicker than normal moxa sticks, the thunder stick gives off a greater and deeper penetrating heat. 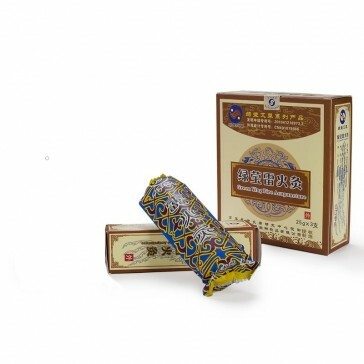 Thunder stick Moxibustion sticks contain herbs such as Mu Xiang, Sheng Jiang, Chen Xiang, Capillary Artemisia, Qiang Huo and Boswellia Carterii. Traditionally used in China for indications such as: Eye, ear, nose & throat diseases, bi-syndrome, obesity, gynaecological & andrological diseases. No longer comes with bamboo holder. Likes : the best moxa i have ever used for deep penetrating heat . I have 4 bulging discs and associated stiffness . My wife used it on me outside in the garden for 10 minutes to the affected lumbar areas . The heat was very soothing but penetrating without burning the skin topically or giving a sunburn effect bu there was a lot of vasodilation -Hyperemia Half hour late i was sitting down and noticed a dramatic difference in comfort and range of motion . Fantastic !!! My stiffness and low grade ache was gone . I also liked the way it comes in a holder and it is easy and safe to extinguish . Good value for Money for what it is supposed to do . Dislikes : The Moxa smoke goes through everything . Even tho we were outside and there was a breeze -the smoke went through my clothes and my short hair big time ! i had to put the clothes in the wash immediately . The moxa is hard to light and get going , Needs a barbecue lighter or similar to get going . Summary : great moxa and really delivers . Impressive for muscular complaints ! but suggest cannot be used in a normal clinical setting due to the smoke . If in a clinic then special tube like exhaust would have to be set up . This is not a big whinge on the smoke - one has to expect that with this sort of moxa but of course there are the drawbacks . If it were not for the smoke i would be using it for everything !